turning it on to the highest level. the devil says, "Oh crap, she's up." a start of something ending...well, whatever. 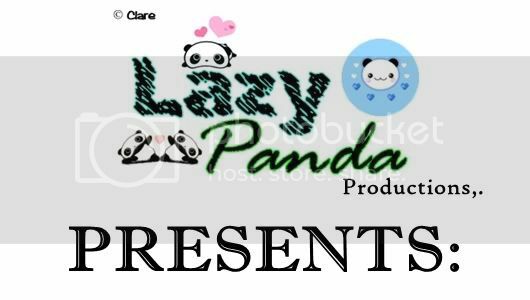 Wahh~ Im so bored to day Im rotting...so i thought i edit my account here in LJ (that i made days ago..) I'm gonna post my reviews about anything I thought up, whether it's about an anime episode, drama, manga, songs, bands, toilet papers or anything...I'm random so please take in mind that I may posts reviews on non-sense to sense stuffs...please do comment if you think i typed something wrong or i said something stupid/insulting,,,i might type something out-of-the-blue and i usually don't proofread it to see if i make mistakes or what so ever...and also i don't have posting patterns,,so i might post today,,,then next year,,then the day after,, then i might abandon this completely...also i may go out in space sometimes so please excuse me if i update after eternity...and of course, my grammar..English is not my mother touge/language so i might (so many 'might') spell something incorrectly or the message im trying to say ends up sounding something bitchy..please excuse. It's just not the face that tells what a person feels, sometimes, it's on the song she's blasting in her ears. *Do not use/reproduce quote unless permitted. Attach credit if so. Junnosuke Taguchi is recognized for being good at acrobatics. He needed an operation in February 2004 after sustaining a bad knee injury during rehearsals and did not return until August 2004. 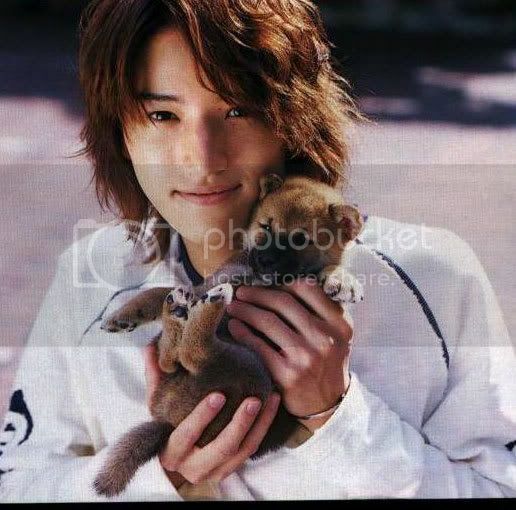 Taguchi is known as the most light-hearted member with a carefree-like nature. Often picked on by the other members for his frequent use of dasharé ( pronounced:'dajare'; Japanese word puns), he also has a tendency to randomly jump between topics during meetings and interviews leading the others to label him "KY" (a person who is unable to read an atmosphere properly). Taguchi is an award-winning actor with roles in Mohou-han, Ganbatte Ikimasshoi, Happy!, Happy! 2, Hanayome to Papa and Yukan Club. Current Location: dringking with ueda...! Jin Akanishi (赤西 仁 ,Akanishi Jin?) (born July 4, 1984) is a Japanese idol, singer-songwriter, actor, seiyū and television personality. 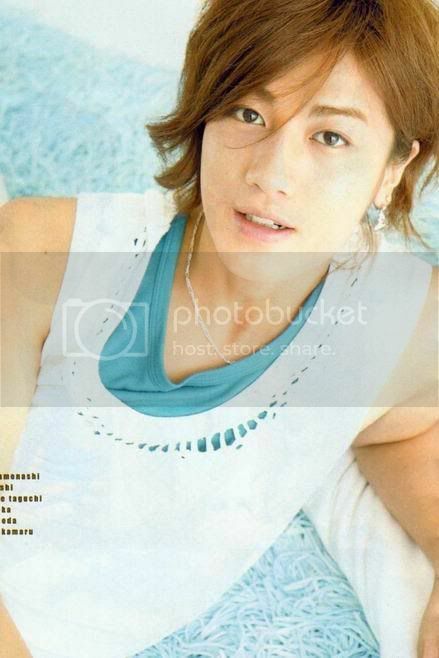 Akanishi is a member of the popular J-pop boy band, KAT-TUN, and is the second vocalist. 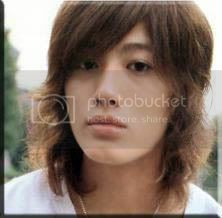 Akanishi is also a budding actor with roles in the second season of popular NTV school drama, Gokusen, and Yukan Club. He is also a co-host of KAT-TUN's own variety show, Cartoon KAT-TUN. 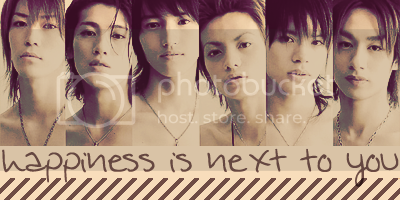 As I have posted in my past entry, KAT-TUN is a 6 member group. K stands for Kamenashi Kazuya, the unofficial leader. 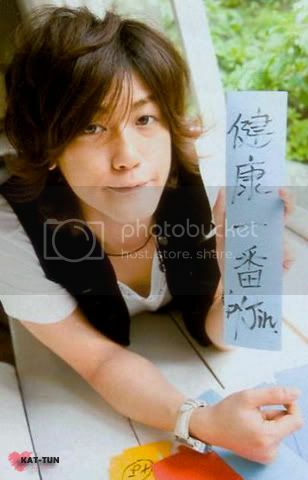 A stands for Akanishi Jin, co-sings with Kamenashi. T stands for Taguchi Jun'nosuke. T stands for Tanaka Koki, the rapper of the group. U stands for Ueda Tatsuya and N stands for Nakamaru Yu'ichi, the beatboxer. Yes I know, the descriptions seems boring and probably will cause my head if some fan girls read it, so to give justice, I will post more infos about them, this entry if for Kamenashi Kazuya, unofficial leader of KAT-TUN. Enjoy! KAT-TUN, KAT-TUN, KAT-TUN...who, what, where, when and how. Current Mood: nothing to do makes me tired..